Using the sun to heat water is a very cost effective way to save energy. Typically payback on even the most expensive systems is under ten years, with DIY Solar Water Heaters paying for themselves in just a few months. 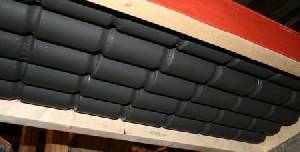 Similar techniques can be used to make a Solar Space Heater – a device which warms the air inside a room or building. Pictured above is a simple small passive solar heater made from recycled aluminium drinks cans and used to heat a garage. If the building to be heated is well insultated, a solar heater such as this can lift the temperature by a significant number of degrees. A larger heater or a number of similar heaters can be used to heat larger spaces, or to heat smaller spaces to a higher temperature. Offcuts of 2 x 4 and a sheet of plywood were used to build a box to tightly hold 5 rows of 10 black-painted aluminium drinks cans. The inside of the box was then sealed using caulk to prevent hot air from escaping. Cold air is drawn in from a hole at the bottom of the box, and the heated air emerges from the top passing through a pipe into the garage to be heated. A plexi-glass sheet was glued to the box to let sunlight in but not let the hot air escape. Click here to find out more about this basic almost free garage heat project. Read on to find out how to make your own solar heater. This type of solar space heater works by drawing the air to be heated into the bottom can of a column of cans. The air is then heated inside the cans by the sun’s energy and the hot air within them rises upwards (thanks to convection) to be fed into a pipe which re-enters the building to be heated. First of all make a box out of whatever scrap materials you have to hand. Set the dimensions to that the width of the interior of the box is exactly the same as the width of however many columns of cans you would like to use in your heater. The height of the box should be the same as however many cans you would like to have in each column plus a few centimeters. For increased efficiency, you may choose to insulate the box to prevent heat escaping (by conduction) through the plywood. If so, size your box so that the cans and insulation will fit snuggly. For the air to pass through a column of cans, holes must be drilled into them. Remember that there is already a hole at the top of each can out of which the drink is poured. That just leaves holes at the bottom of each can to be drilled. Then the cans of each column are glued together using caulk or silicon adhesive and painted using black paint to help them absorb the sun’s energy. Barbecue or fireplace/stove paint is excellent for this as it will not flake off, but any marine grade paint will do a similar job – just make sure it has a totally matt finish to maximise solar absorption. The inside of the box must also be painted with the same paint before the columns of cans are glued into position using caulk or silicon adhesive. The outside of the box should be treated with preservative, varnish, or paint to help it survive exposed to the sun, wind, and rain, for many years. Ideally the front of the unit will be sealed with a sheet of tempered glass – glass of the type used in car windscreens. This glass is very strong and resilient to heat. However, tempered glass (unless you can find and recycle a sheet) is also very expensive. As a cheaper alternative plexi-glass (plastic) can be used, but note that it will degrade over 3-5 years becoming translucent and eventually opaque which will reduce the energy this heating system can get from the sunshine until you replace the plexi-glass sheet. Pictured above is an alternative design in which the cans are all joined together in a snake. The illustration shows an array of just 3 x 3 cans for simplicity however hundreds of cans could be joined in this way to make a larger heater. Air inside this snake would rise much more slowly through the heater (than was the case in the previous design) since it has a much longer path to travel, and the air is obstructed from rising straight upwards. 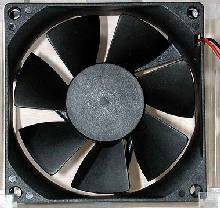 Therefore the air leaving this heater will reach higher temperature than it will in from the previous design BUT the quantity of air heated will be less. A PV Electric Solar Panel could be used to power a small fan (such as that used to cool the processor in a computer) to drive air through the snake. The final temperature achieved would be lower, but having a large quantity of 30 degree Celcius air entering a room is usually going to be much better than a much smaller quantity of 50 degree Celcius air. This article: Pop Can vs Screen Collector compares the efficiencies of drinks can solar air heaters to the screen collector type of air heater which used to be more commonly used. 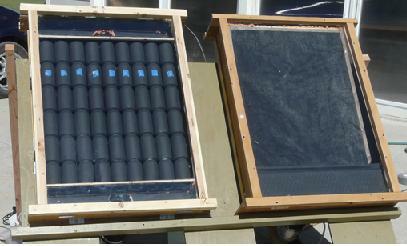 It also shows in well illustrated comprehensive detail how to make both types of solar air heater. 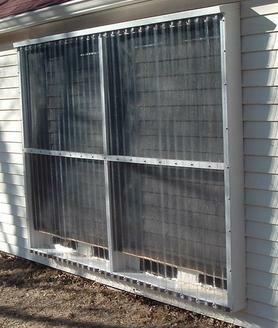 This article: DIY Solar Air Heater, details the success of a 240 can solar air heating panel in Michigan, USA constructed by Guy Sperry. This panel provides heat for the whold of a 1000 square feet home. 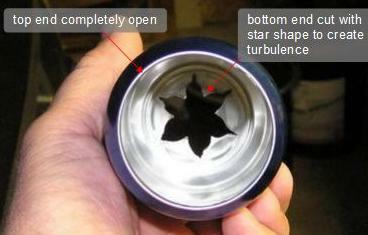 He cut a star shape into the base of each can in order to introduce turbulence in the air flow through the panel and also to draw heat from the sides of the can to the centre to heat the air passing through. He carried out some detailed datalogging and analysis over a couple of winters to understand the effect of the solar air heater and presents some of that information in his article. An alternative, very simple, but larger solar air heater design is detailed on this instructables page:Solar Heater – for which no cans are required.